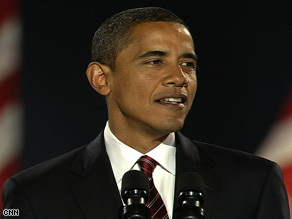 (CNN) -- Barack Obama, the first African-American to be elected to the White House, will be sworn in on January 20, 2009. Barack Obama now needs to appoint his White House teams and cabinet. Obama has around two months in which to do so. In many other national elections, the time period given to the victor to assume office is much shorter. After UK general elections, for example, the outgoing prime minister usually has to vacate their official Downing Street residence by lunchtime the following day. He will also want to avoid the delays that hit Bill Clinton's transition to power after the 1992 U.S. election, when many top staffers were only announced five days before inauguration day. Obama already has a transition team in place on Capitol Hill, has met with key advisers and is expected to make cabinet level announcements in the next 10 days. His team will work with the Presidential Transition Coordinating Council, established by executive order of President Bush to oversee the process. And he will also begin to receive top-secret national security and foreign intelligence briefings from the CIA as he begins to face foreign policy challenges. Obama already has a vice-president in place with Delaware senator Joe Biden, who he announced as his running mate in August. But the role only comes into its own if the president is incapacitated and arguably serves its true purpose on the campaign trail to round out the party ticket. Instead much of the power rests with the White House chief of staff, who heads up the president's immediate staff in the Executive Office, and who is likely to be his first appointment. One name being talked up is that of Rahm Emanuel, who sits in the House of Representatives, the lower house, and who like Obama comes from Chicago. The president will also have to make some 30 cabinet appointments, according to the Center for U.S Global Engagement -- and all will be subject to approval by the Senate, the upper house of the legislature. The chamber's Web site says it has power to approve 2,000-plus positions overall including ambassadorships, Supreme Court and federal judges and heads of regulatory commissions -- but that "about 99% of all presidential appointments are approved." iReport.com: Who should be in Obama's cabinet? Stephen Hess, Senior Fellow Emeritus, Governance Studies at the The Brookings Institution, suggested in 2001 that as a rule of thumb an incoming president need have their White House appointments -- their immediate inner circle -- in place by Thanksgiving (November 27) and Cabinet staff by Christmas (December 25). Expect Obama to move quicker than this, in part through his keenness to build on campaign momentum. Many U.S. presidential election winners switch tone soon after their campaign for office has finished. "Reagan is his model," Martin said, invoking the two-term Republican office-holder of the 1980s. "He [Obama] is going to call people to arms." David Gergen, CNN senior political analyst, added that Obama had a conference call with his national team Wednesday and said at the end of it: "Every one of you is going to be paid for another month and you will have healthcare for the rest of the year. I have never heard of that in a campaign before," Obama said according to Gergen. The signs are that both the White House and the incoming administration will want the process to proceed as smoothly as possible -- and neither will want any echoes of the transitional spat following 2000's disputed election. Republican sources alleged in January 2001 that White House keyboards had had the letter W. removed as a joke at the new president's expense -- a claim denied by the Democrats.